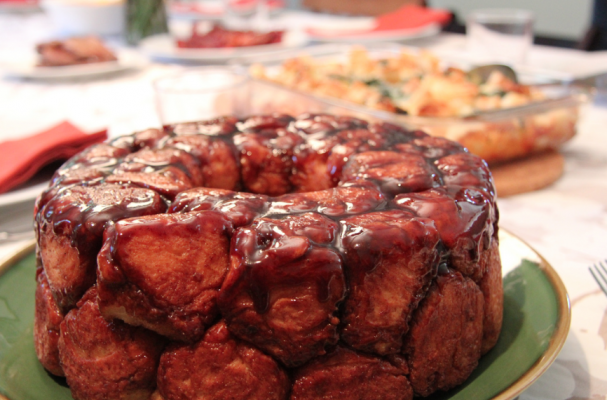 Monkey bread is a classic brunch dish your Mother's Day meal cannot be without. No one (and I mean no one) can resist buttery balls of dough dipped into brown sugar and dusted with toasted pecan chips. You will be reaching for second, thirds and fourths. If you want to really spoil mom, you can drizzle with salted caramel sauce. Step 1: Pre-heat your oven to 375 degrees. Step 2: Open biscuits and pull apart each biscuit into halves and roll into balls. There should be 20 balls total between both cans. Step 3: Melt 1 tbsp of butter and grease bundt pan so it doesn't stick. Step 4: Add your nuts. Step 5: Melt the remaining butter, brown sugar, water in pot. Step 6: Then layer your balls all around the bundt pan. Step 7: Pour over your sugar butter mixture. Step 8: Place in oven and bake 20-25 minutes. Step 9: Allow to cool for 5 minutes then flip upside down to get the perfect "Monkey Bread" ring!